Here’s what’s happening in the world of television for Thursday, November 2. All times are Eastern. 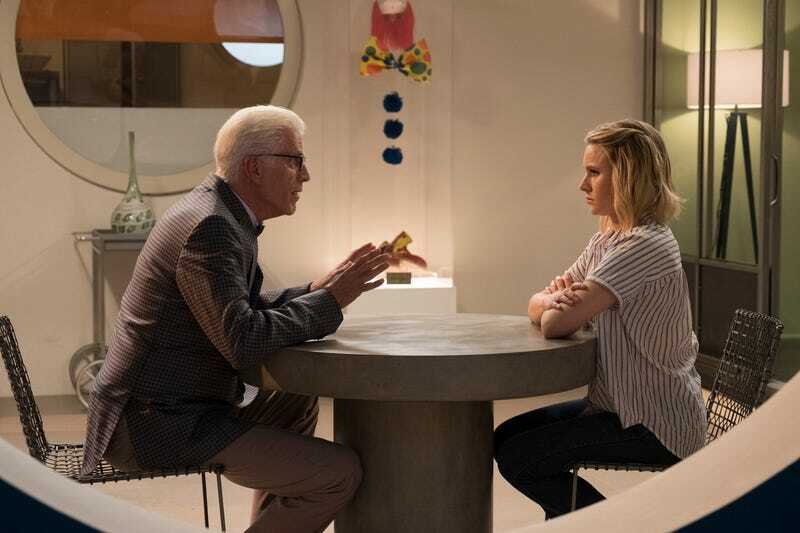 The Good Place (NBC, 8:30 p.m.): The Peacock’s entire Thursday-night lineup hits the bench next week, after the network takes the Thursday Night Football handoff and charges toward 2017’s end zone in hopes of scoring a ratings touchdown (and an increase of sports terminology and metaphors in its primetime programming). Superstore and Will & Grace will be back for holiday episodes in December, but tonight’s the last new Good Place you’ll get to see this year. (The show returns for the remainder of the season on January 4, 2018.) The supernatural sitcom was already great during its first season, but in its second, it’s blossomed into the best forking sitcom on broadcast TV, sticking the landing on some flying conceptual leaps, bringing new shades and complexities out of a TV legend, and cramming its frames full of hyper-specific allusions and unabashedly silly puns. (And as of last week’s epilogue, it has gained another important comedic advantage: Jason Mantzoukas.) If you need to find Dennis Perkins after the midseason finale, he’ll be in his void. S.W.A.T. (CBS, 10 p.m.): Take it from Josh Modell: If you’re not a 12-year-old boy who’s into big, dumb explosions and paying lip service to fraught conversations about race relations, there’s no reason to watch S.W.A.T. Just listen to the theme song from the original 1975 version instead. Oh yeah: Dig that sick wah-wah guitar.